Peter Day, a gentleman and a scholar. 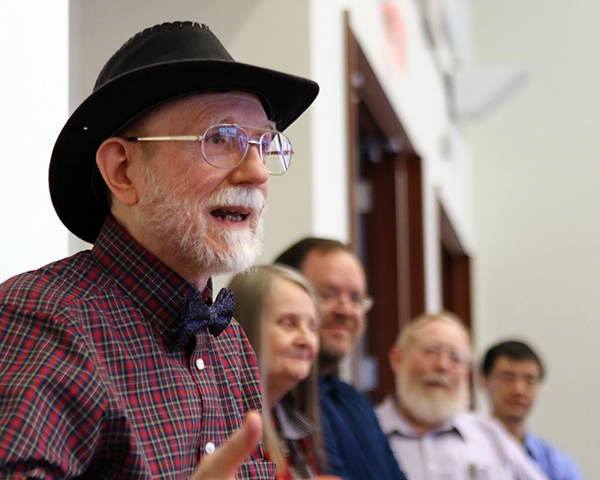 Peter Day was honored this week as he reached the end of a 43-year Emory career that spanned the history of computing at Emory. Peter spent most of his professional career at Emory as well as receiving a degree in math from the university. Peter Day’s father, R.A. Day, was a chemistry professor at Emory. He met Peter’s mother at Emory when he accidentally leaked distilled water from his lab into hers. Love blossomed, a family was created, and soon Peter was born and began his Emory journey. While a student, his first job was shelving books in the library. Peter Day met his wife at Emory and his mother, two brothers and sister are got degrees here. “He bleeds blue and gold,” said Anne Marie Alexander, who presided over Peter’s retirement event. 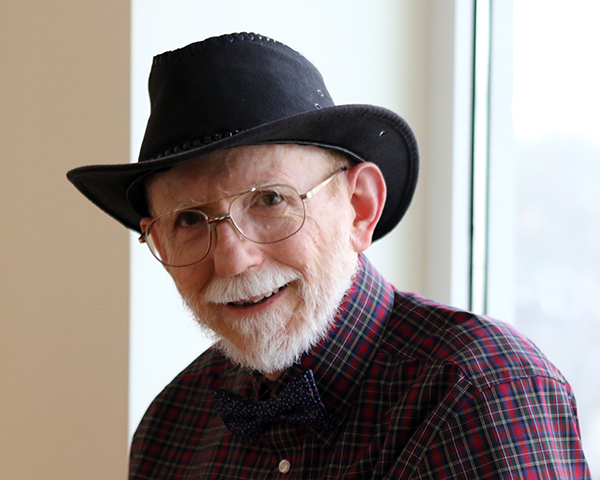 After graduating from Emory, Peter received a PhD in math from Cal Tech, dabbled in teaching for a few years, then returned to his alma mater where he spent over four decades in the IT world. In 1972, Peter became Emory’s manager of operating system support (“I had hair back then,” he quipped). During that time he worked on the university’s first mainframe. In the 80’s, Peter wrote the grant request that obtained funding to connect Emory to NSFnet (the precursor of the commercial Internet). In 1997, he wrote the grant request that obtained funding to connect Emory to Internet2. You can read an interesting article about his (and Emory’s) history of computing in a 2008 article of the Online News. Most recently, Peter was one of the architects of the new identity management tool, which resulted in him being one of the recipients of the very first LITS Significant Contribution Award. He was a tireless documentarian of all things computing in the knowledge base. Peter spinning a yarn for his colleagues. According to his brother Mike, Peter’s job now is to serve as the patriarch of the Texas branch of the Day Family. Despite his moving to Texas, you can still reach Peter at peter [dot] day [at] emory [dot] edu. Best of luck, Peter, and if MyPassword breaks, we are calling you! This entry was posted in Staff Bytes and tagged Identity Management, retirement. Bookmark the permalink. Post a comment or leave a trackback: Trackback URL.